Facilitator Hosting Packet for Seven Springs! 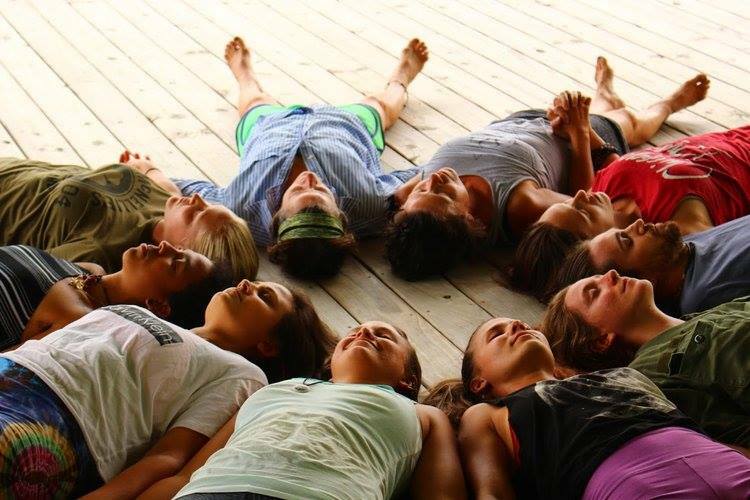 To provide an innovative and transformative space for local and global communities to experience high quality holistic education and experiences. 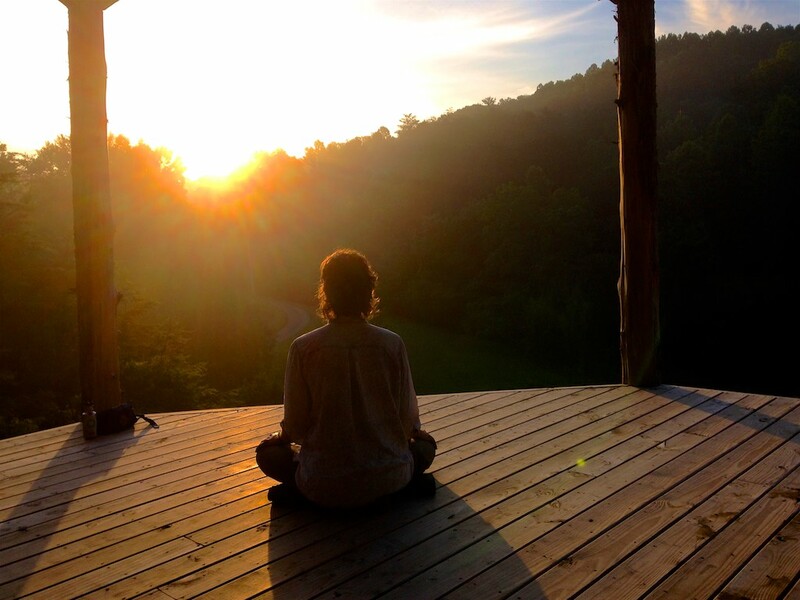 Seven Springs is a retreat center featuring seven natural springs on 126 acres of private land in the foothills of the Great Smoky Mountains. 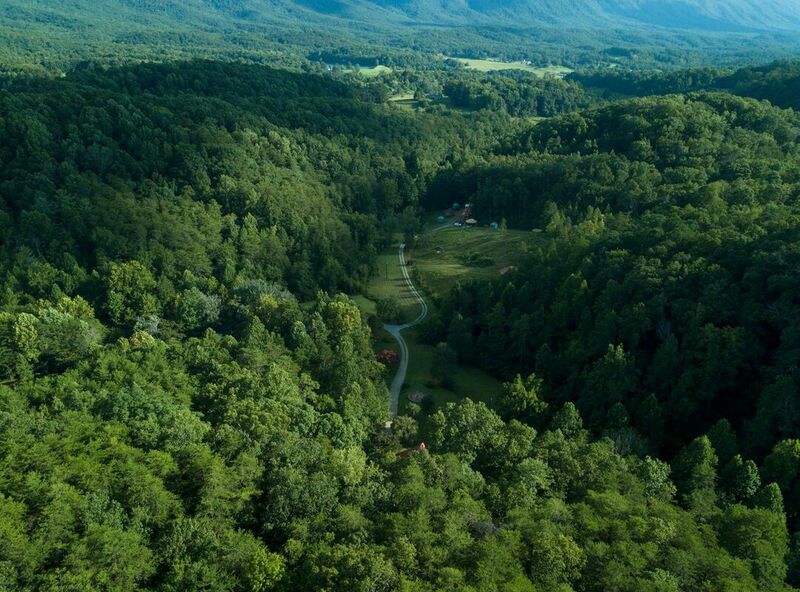 Near Maryville, Tennessee, Seven Springs is located within 500 miles of 75% of the U.S. population. The land is also some of the most ecologically diverse in the country. The high elevations of the Smoky Mountains are a temperate rain forest with over 17,000 species of plants and animals. The incredible biodiversity of the region adds to the abundant richness of Seven Springs. community to enjoy. Now as years have passed, the land sits here, waiting for what next it is to raise. We now hope this land raises consciousness, awareness, and connection. 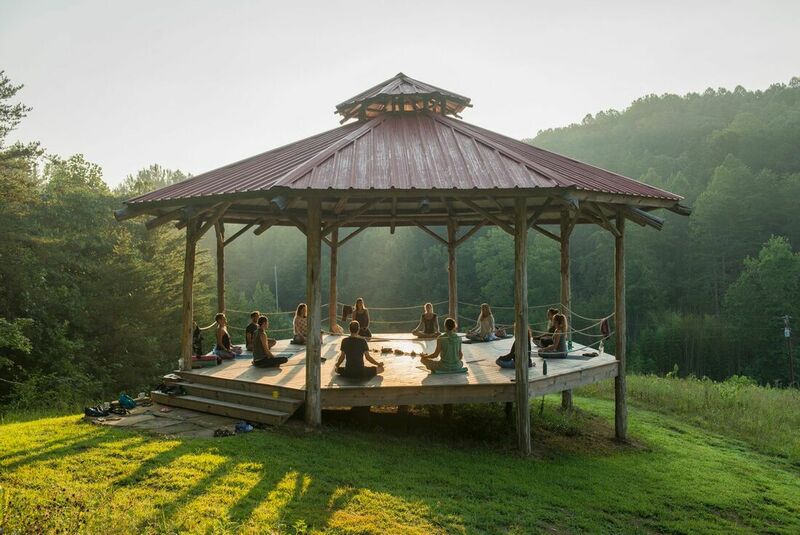 This land is here to be a part of our lives, and we are delighted to share it with our community as a space to host and participate in retreats and events. Jessi was born and raised on Seven Spring’s land. Her German grandmother, Oma, who first found the land, taught her courage to jump across the stream. It wasn’t long before she jumped abroad and founded Global Just Designs, a fair- trade clothing business dedicated to improving the lives of Maya women in Guatemala. Meanwhile, Zach had been living in Guatemala for years working at the University and founding an NGO based on creativity. The two finally crossed paths in 2014. 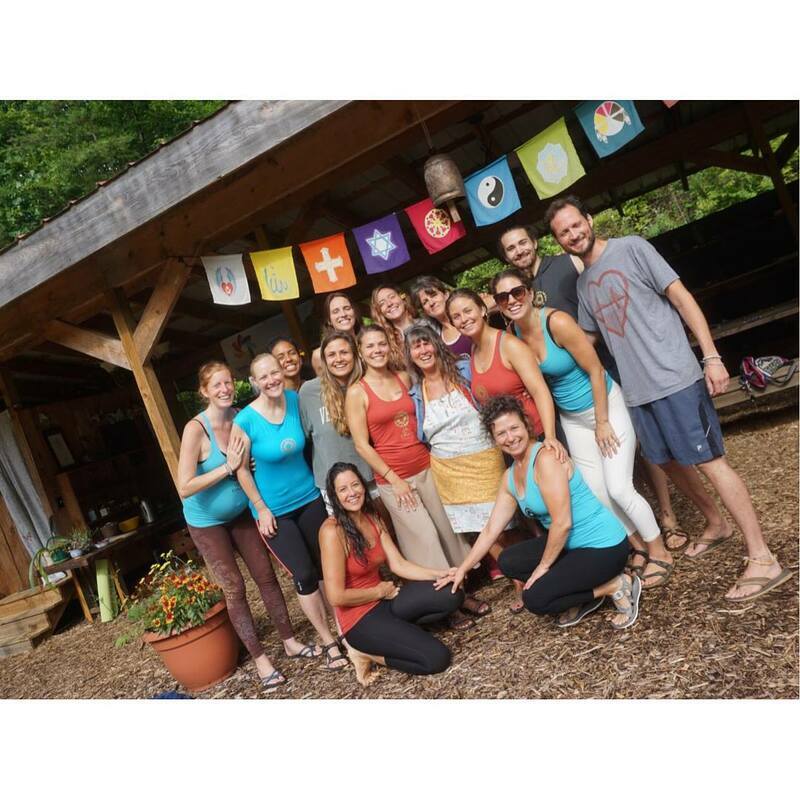 They soon co-founded the international yoga school Kula Collective in 2015 and continue to dream up ways to express their passions for holistic learning in Seven Springs. ​Herman's mother, Oma, brought him from Germany to Maryville to live with his stepfather at the tender age of 9. His story of adaptation to East Tennessee culture is an example of building community. His mother bought the land where Seven Springs now resides in 1977. 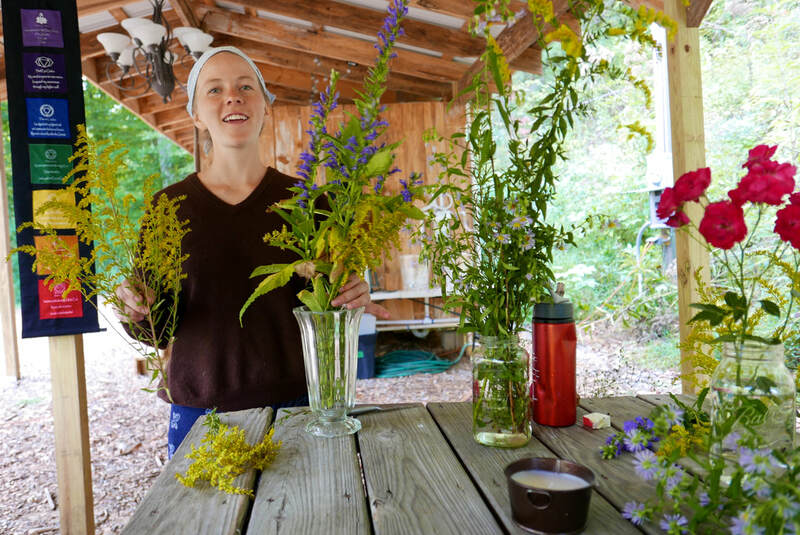 Soon after, Herman met Mary, and together they studied agriculture, plant sciences, animal husbandry, and forestry at University of Tennessee, melding select principles with those from the "back to the land movement" on their new land. Over the years, Herman and Mary have worked together in pipefitting, welding, and owned a landscape and greenhouse business for twenty years. Most recently, Mary worked for the US Forest Service in forestry and ecology. They are both happily retired now sharing their gifts and experience with Seven Springs. 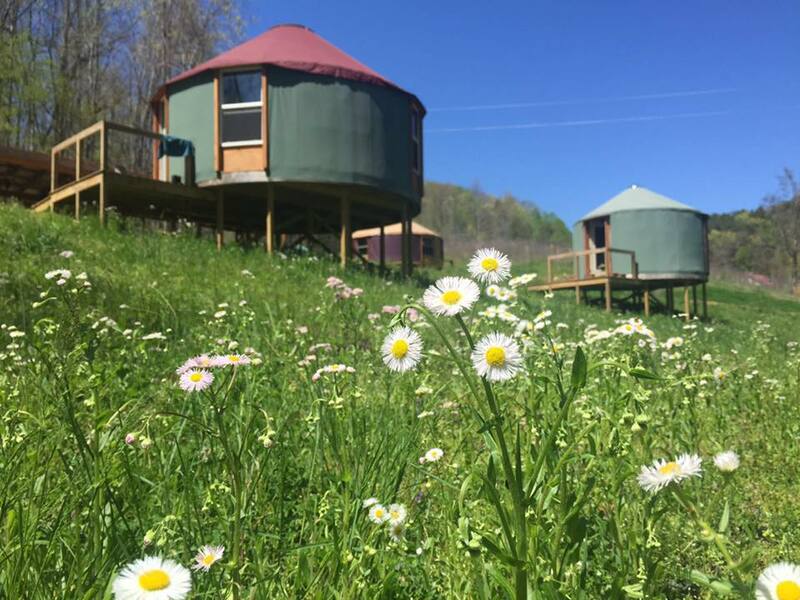 Wendy and Danny have a beautiful organic farm called Santosa in Pulaski, Tennessee where they mix southern hospitality with Ayurvedic wisdom. They join us at Seven Springs during retreats to provide meals and so much more. 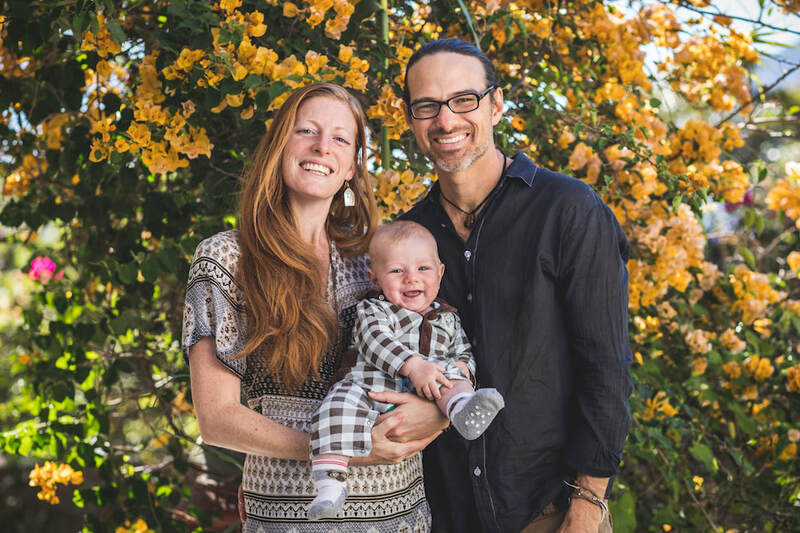 Wendy holds a 500hr certification in Yoga Therapy, as well as lifetimes of wisdom. 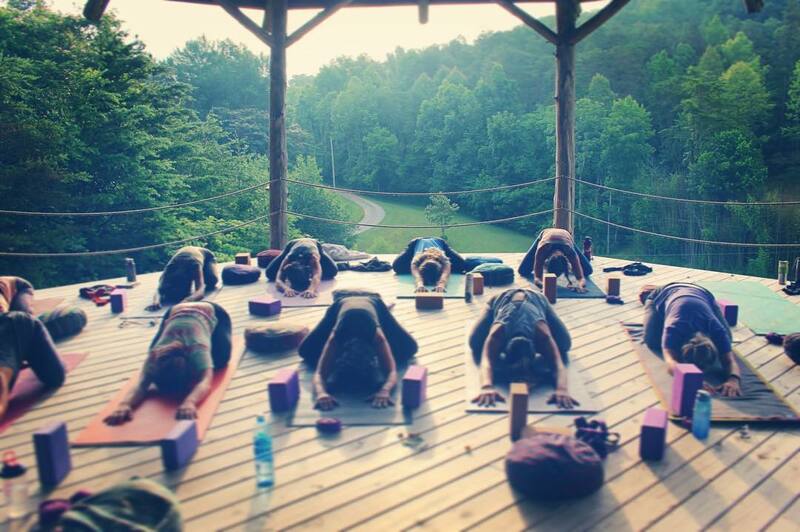 She nurtures those at Seven Springs in our minds, bodies, spirits, and our bellies. To say that they’re the kitchen staff is like saying yoga is stretching. They are SO MUCH more than that. They share love, nurturing, and experience with all those who are here. 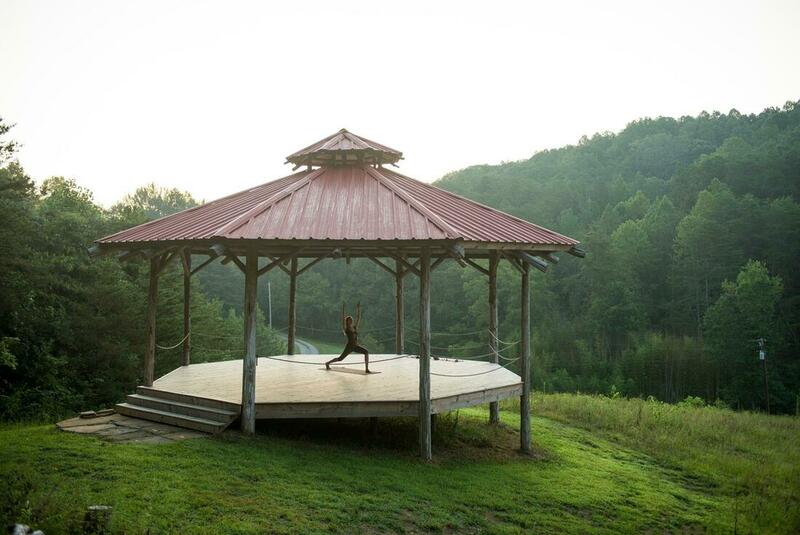 Standing 16 feet tall and 28 foot diameter, our yoga shala is held by mighty cedar tree poles from our forest. 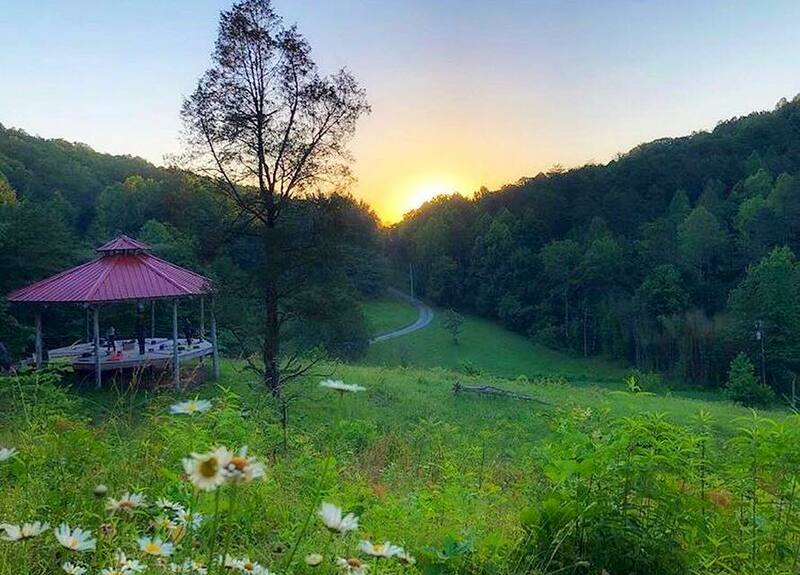 Enjoy glimpses of the first light of sunrise in this open air pavilion with a breathtaking view of the Chilhowee mountains. We have 20 meditation cushions, 15 yoga mats, 10 blocks and 10 straps for student use. We find the best food is cooked outdoors! Our kitchen features a gas stove, refrigerator, large sinks, and ample preparation and storage space. For nightly gathering or special ceremonies, this is a space to bring people together around the fire for music, celebration and camaraderie. Our classroom is a 24’ yurt with a beautiful original labyrinth design on the floor, created to support experiential learning. The space is outfitted with whiteboards, electric outlets and lights. Flexible space for 10 yoga mats makes this an ideal place to learn, practice and design. The open air massage pavilion sits upon a hill near the shala. Relax on our massage table with a massage by one of our team of therapists. Our bathrooms have water-saving flush toilets, sinks, and on-demand hot showers. We have several ideal camping spots along our creek. These are near the community kitchen and bathrooms. 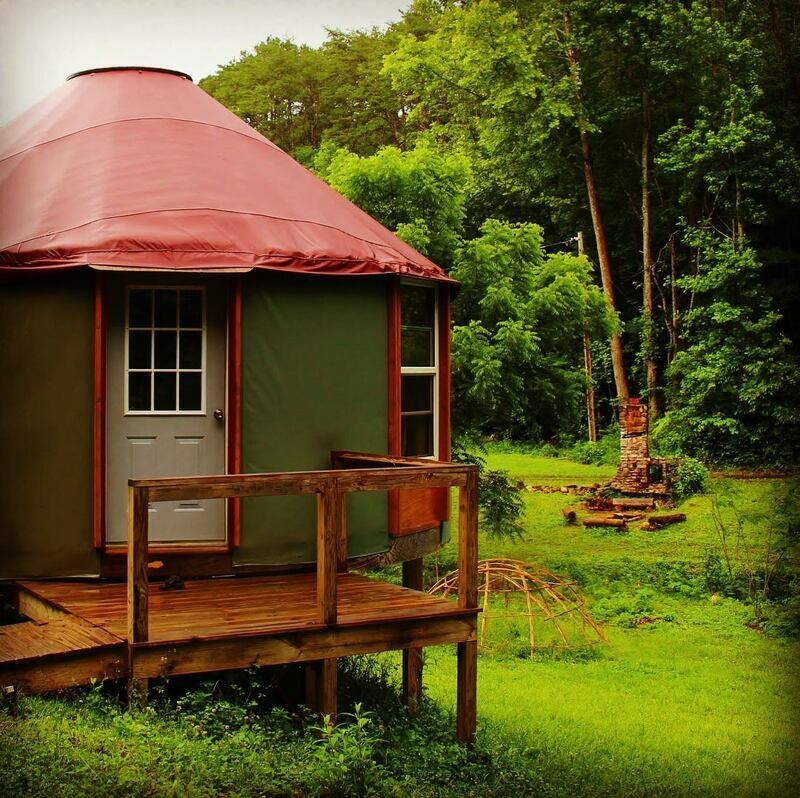 Our Glamping option includes a mattress, linens, and a lantern inside a spacious 13’ tent. 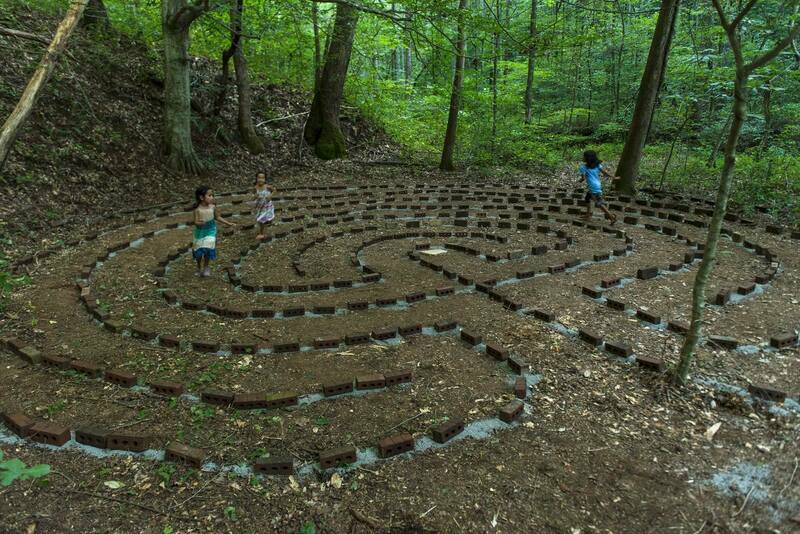 A traditional 7 course labyrinth lies nestled within a natural bowl, shaded by old growth Elm trees. This recreation of ancient sacred sites is a powerful setting for walking (or running!) meditation and prayer. Walk along the creek that emerges from the head of Sweet Hollow. Drink pristine waters from a natural tap. At the head of the watershed, these forested slopes make for perfect aquifers. In loving memory of the matriarch of Sweet Hollow, Ruth Hauth Long, Jessi’s grandmother. In “Oma’s house” tea was always to be enjoyed around 4 with sweet rolls. This garden includes herbs and plants perfect for afternoon tea. 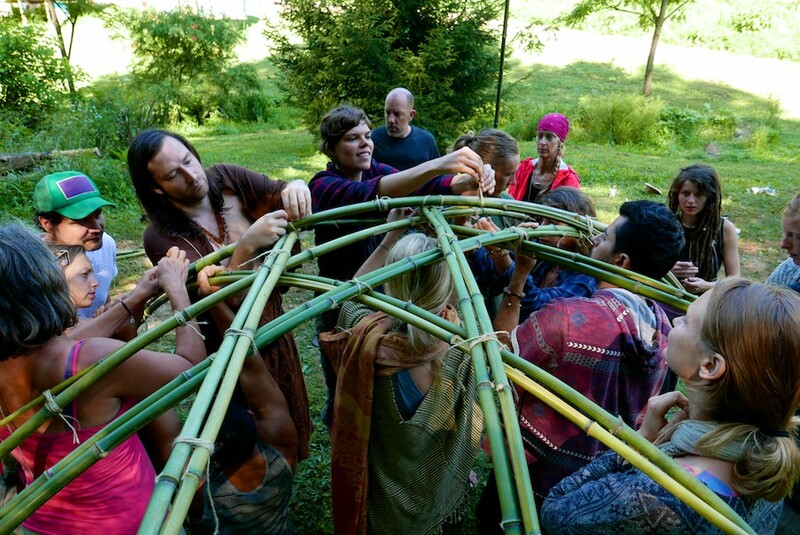 This traditional lodge of woven from supple young Maple saplings was built by Frank Genovese, Yona FrenchHawk, Carolyn Little and their retreat members. The sweat ceremony as led by Yona reflects his full- blooded roots. As an elder of his communities, the stories and songs of his ancestors are woven into prayer in a compassionate cleansing experience. 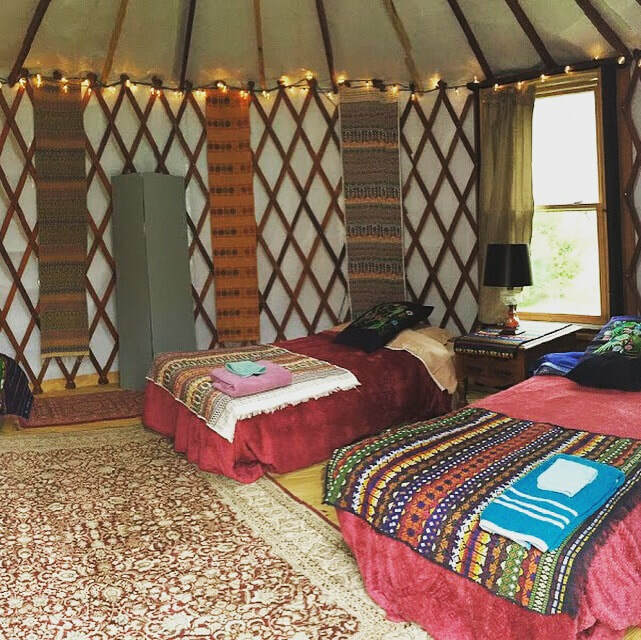 Whether you’re staying for a night or a month, your car will be safe a 5 minute walk from your Yurt or campsite. 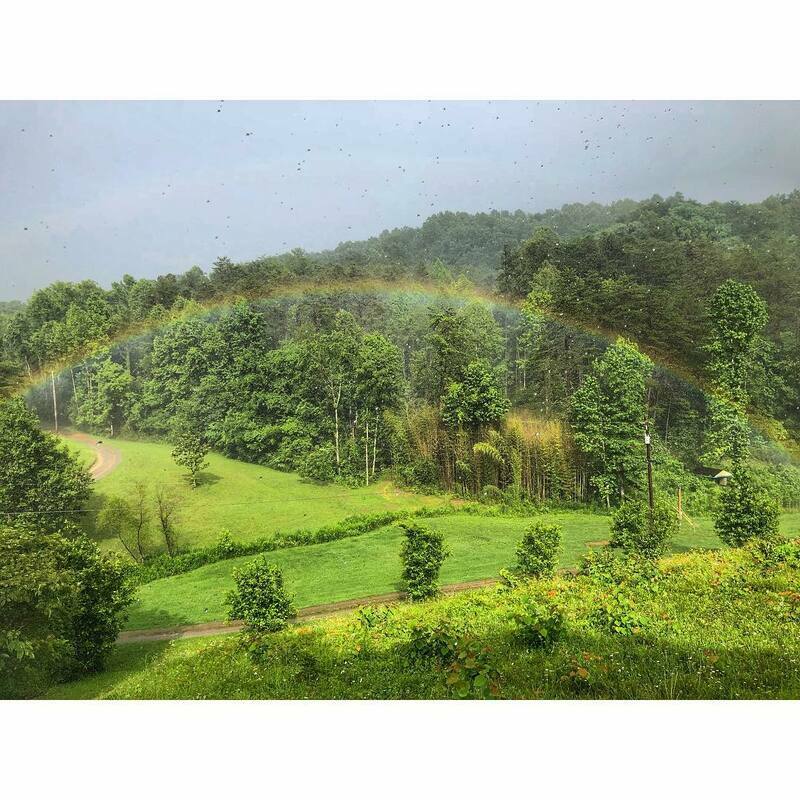 Weather: East Tennessee is hot and humid in the summertime and can be snowy in the winter. We enjoy beautiful springtime flowers and incredible Fall colors. Leave No Trace: We live close to the land at Seven Springs, so please act accordingly. Be sure to dispose of waste in the appropriate recycling or compost bin. In general, please be aware of what you are consuming to limit the waste it produces! Disconnect to Reconnect! There is no wifi access on Seven Springs. Take time to connect with the surrounding plants and trees and most of all with yourself. Respect for Wildlife and Plants: As we are sharing this home with the wildlife, we ask that you tread softly on the earth. There are bears in our area along with other animals so please give them their space! Thank you for NOT leaving any kind of food in your sleeping quarters. All food MUST be properly stored in the kitchen area. This is for bears, raccoons, skunks, and any other little critter who might smell it. We also have quite a bit of sister ivy on the property. Sister ivy, better known as poison ivy, is identified by three leaves. So remember, leaves of three, let it be! We suggest that when you shower, scrub all exposed areas well. You have up to two hours to remove the oils before they cause the itchy reaction on your skin. If you’re particularly allergic, consider using a Jewel Weed salve. We have some for emergencies in our first aid kit. Jewel Weed oil is a natural counter to sister ivy. In nature they grow next to each other representing a beautiful symbiotic relationship. How to Use the Kitchen: For most events the kitchen will be run by our team who will prepare the meals for everyone. If you’d like to support the preparation you can coordinate with us. You can bring your own snacks or food but be aware: storage space in our critter-proof storage areas is limited and there is no food allowed in tents or yurts. Please mark all food with your name and date. Any food without a label will be used or composted after a few days. Dishes: At meal time, please clean your own bowl and eating items at our washing station. There are five steps in this system: First scrape off the food particles in the compost bin, Second scrub with natural soap, Third dip in water to rinse, Fourth soak for a few seconds in vinegar to sterilize. Finally, place your items on the drying rack. 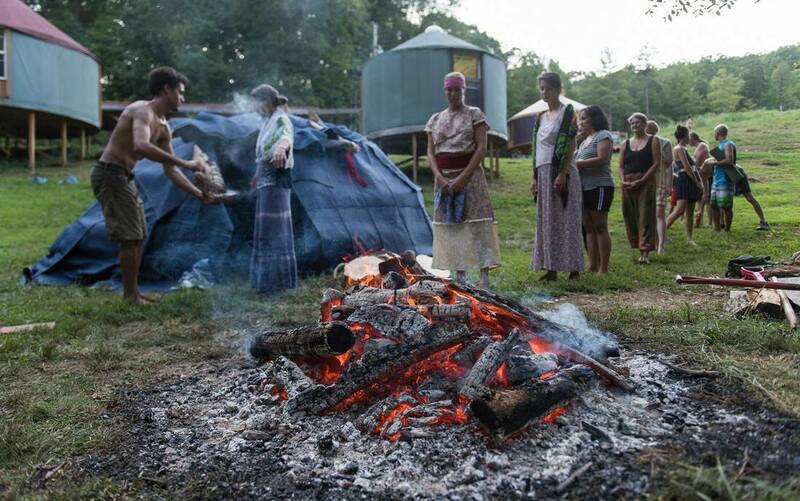 Laundry: We provide towels and linens for the Yurts. For longer stays, personal loads of laundry may be requested for a $10 fee. 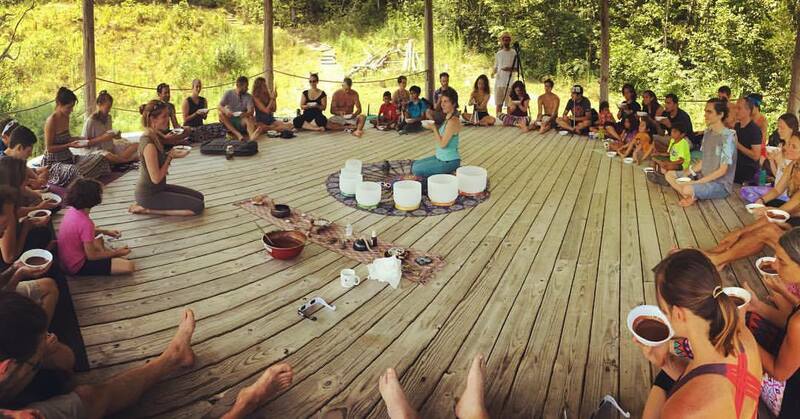 Karma: We like to practice small offerings of karma (selfless service) during your experience at Seven Springs. Please treat the space as if it were your own. 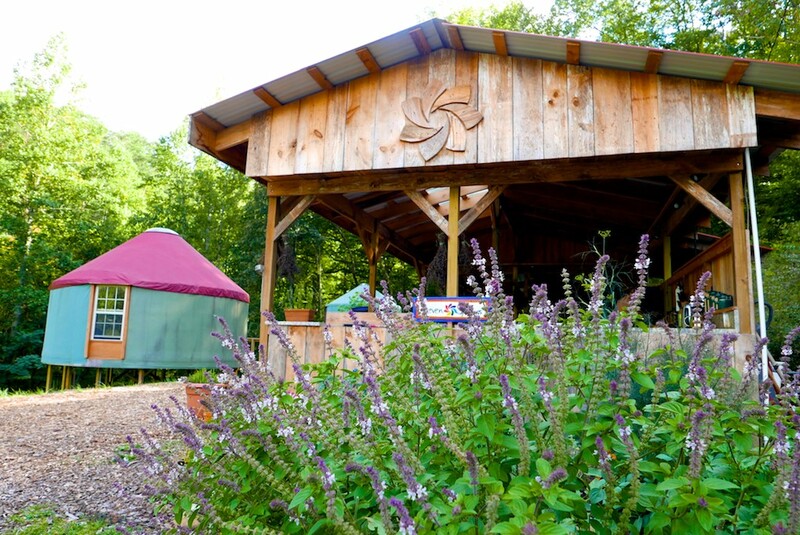 This is a family-style retreat center, and we hope that each person that comes leaves their positive energy and a clean space! BE ALERT! Our address isn’t recognized by some systems (such as imaps), and others might send you to another location or to our inaccessible back entrance. We recommend Google Maps! large blue mailbox with 120 Sweet Hollow Way sign on top (this is next to 1344 Galyon Rd address and mailbox). Turn left immediately after the blue mailbox onto our gravel driveway and follow the signs to Seven Springs parking. 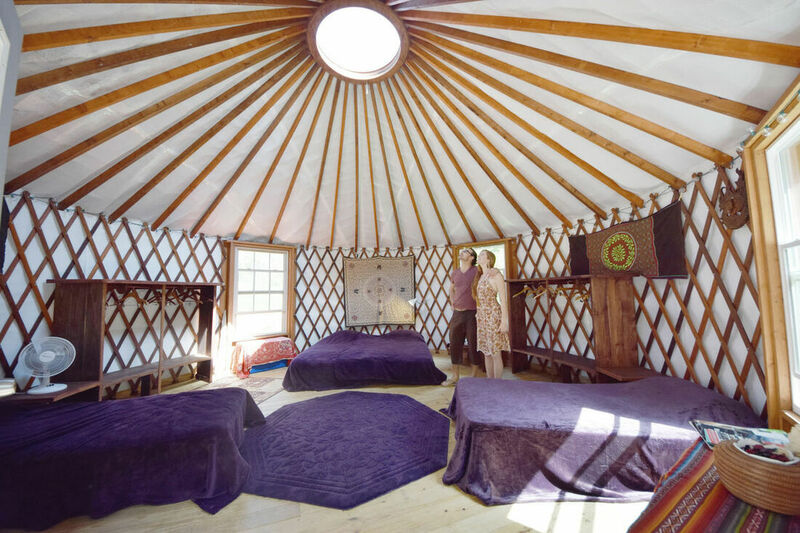 You may drive to your yurt or camping space to unload, and you will then return to park your vehicle in our parking area. If you get lost, please call (865) 221-3841 OR (865) 268-3913. Verizon Wireless has the best service in this area. The nearest airport is the Knoxville International Airport, TYS. The airport is actually located in Alcoa and only about 25 minutes from Seven Springs. You may also look into flying into the Atlanta International Airport and taking the bus or renting a car to drive to Seven Springs. The Atlanta airport is about a four hour drive. Nashville offers additional airlines and the airport is about a three hour drive (and in central time zone). A nearby nature education center located in the Great Smoky Mountains National Park, this area is fun to visit for information and connect to some good trailheads! Find more information here: www.gsmit.org/ and information on our favorite moderate waterfall hike, Spruce Flats Falls: www.thegreatsmokies.net/spruce-flats-falls/. 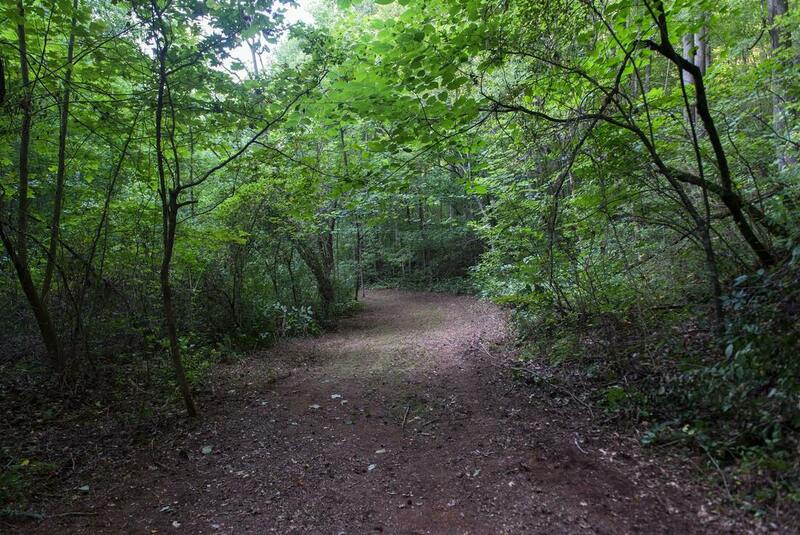 Enjoy the gift shop for books of all ages, and hike for miles along the end of Tremont Road beside the Little River enjoying beautiful cascading waterfalls. About 20 minutes away is a beautiful lake nestled between the Great Smoky Mountains national Park and Cherokee National Forest. Chilhowee Lake offers excellent boating, fishing and kayaking. The backwaters offer beautiful calm water kayaking. Just down the road is state highway 129. Known as “The Dragon”, it includes 11 miles boasting 318 curves spanning from Foothills Parkway in Tennessee to Deal’s Gap in North Carolina. Needless to say, this is a motorcycle and sports car mecca. One of the best ways to enjoy the river in the mountains on a hot day is to go to tubing! There are many tubing companies in Townsend that will rent you tubes and drop you off and pick you up on the river. We recommend just stoping at any of them, they offer deals of $8 up. These prices include three meals a day. Lunch on the day of check out is not included. Additional meals are $13 per person. Children under 8 are free. Special exceptions will be handled on a case by case basis. Retreat Minimum: 8 participants paying full R&B. Payment Schedule: 30 days before the event, 100% payment of all registered attendees is due*. If this amount is less than the deposit ($500) no additional payment is due. All outstanding balances must be paid in full by the first day of the event. Contact us if a student would like to arrive early or stay late. Facilitators may arrive one night early free of cost, all other extra nights will be charged following the same pricing. Cacao Ceremony including ceremonial grade cacao and personalized ceremony. Please note that any trips offered (to the Smoky Mountains or Fire Tower) do not include transportation. We recommend that either facilitators and/or students carpool and drive. We will lead the way as a caravan. Facilitators receiving free R&B do not need to pay the per person amounts listed above. All others will be included. *** We recommend that you receive all R&B payments and then pay Seven Springs according to the timeline listed on page 12 of this document. You may receive checks, money order or by credit card. To receive payment by credit card, we recommend using EventZilla to create the payment page and Stripe to accept credit cards and deposit the money into your account. Each cost $1 per transaction. Please note your credit card company usually charges around 3% per transaction. If you prefer that Seven Springs intake and handle all incoming payments, we are happy to offer this service at a very low rate of 5% per credit card transaction. (3% of this is just for the credit card company!). We ask 3% per check received. • 2 unique Facebook posts promoting your event on the Seven Springs FB page. Thank you for your interest in sharing this beautiful land with us. As guardians we trust you’ll join us in protecting and honoring this beautiful space.